In the two centuries since Dalton developed his ideas, scientists have made significant progress in furthering our understanding of atomic theory. Much of this came from the results of several seminal experiments that revealed the details of the internal structure of atoms. Here, we will discuss some of those key developments, with an emphasis on application of the scientific method, as well as understanding how the experimental evidence was analyzed. While the historical persons and dates behind these experiments can be quite interesting, it is most important to understand the concepts resulting from their work. If matter were composed of atoms, what were atoms composed of? Were they the smallest particles, or was there something smaller? In the late 1800s, a number of scientists interested in questions like these investigated the electrical discharges that could be produced in low-pressure gases, with the most significant discovery made by English physicist J. J. Thomson using a cathode ray tube. This apparatus consisted of a sealed glass tube from which almost all the air had been removed; the tube contained two metal electrodes. When high voltage was applied across the electrodes, a visible beam called a cathode ray appeared between them. This beam was deflected toward the positive charge and away from the negative charge, and was produced in the same way with identical properties when different metals were used for the electrodes. In similar experiments, the ray was simultaneously deflected by an applied magnetic field, and measurements of the extent of deflection and the magnetic field strength allowed Thomson to calculate the charge-to-mass ratio of the cathode ray particles. The results of these measurements indicated that these particles were much lighter than atoms ([link]). Click here to hear Thomson describe his discovery in his own voice. In 1909, more information about the electron was uncovered by American physicist Robert A. Millikan via his “oil drop” experiments. Millikan created microscopic oil droplets, which could be electrically charged by friction as they formed or by using X-rays. These droplets initially fell due to gravity, but their downward progress could be slowed or even reversed by an electric field lower in the apparatus. By adjusting the electric field strength and making careful measurements and appropriate calculations, Millikan was able to determine the charge on individual drops ([link]). 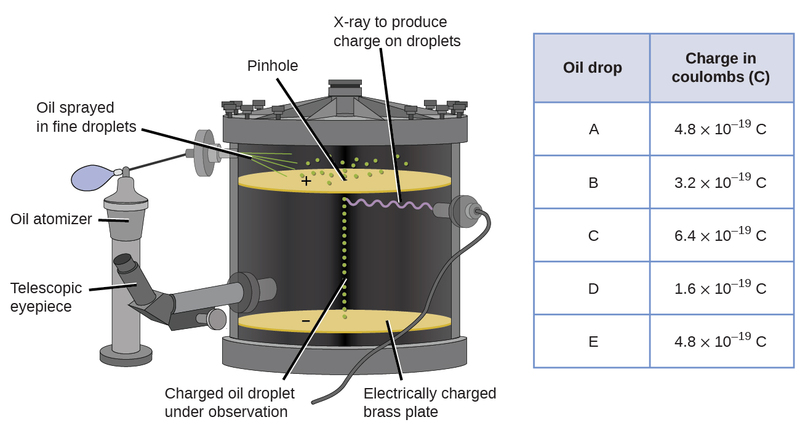 Millikan’s experiment measured the charge of individual oil drops. The tabulated data are examples of a few possible values. Looking at the charge data that Millikan gathered, you may have recognized that the charge of an oil droplet is always a multiple of a specific charge, 1.6 10−19 C. Millikan concluded that this value must therefore be a fundamental charge—the charge of a single electron—with his measured charges due to an excess of one electron (1 times 1.6 10−19 C), two electrons (2 times 1.6 10−19 C), three electrons (3 times 1.6 10−19 C), and so on, on a given oil droplet. Since the charge of an electron was now known due to Millikan’s research, and the charge-to-mass ratio was already known due to Thomson’s research (1.759 1011 C/kg), it only required a simple calculation to determine the mass of the electron as well. Scientists had now established that the atom was not indivisible as Dalton had believed, and due to the work of Thomson, Millikan, and others, the charge and mass of the negative, subatomic particles—the electrons—were known. However, the positively charged part of an atom was not yet well understood. In 1904, Thomson proposed the “plum pudding” model of atoms, which described a positively charged mass with an equal amount of negative charge in the form of electrons embedded in it, since all atoms are electrically neutral. A competing model had been proposed in 1903 by Hantaro Nagaoka, who postulated a Saturn-like atom, consisting of a positively charged sphere surrounded by a halo of electrons ([link]). The next major development in understanding the atom came from Ernest Rutherford, a physicist from New Zealand who largely spent his scientific career in Canada and England. He performed a series of experiments using a beam of high-speed, positively charged alpha particles (α particles) that were produced by the radioactive decay of radium; α particles consist of two protons and two neutrons (you will learn more about radioactive decay in the chapter on nuclear chemistry). Rutherford and his colleagues Hans Geiger (later famous for the Geiger counter) and Ernest Marsden aimed a beam of α particles, the source of which was embedded in a lead block to absorb most of the radiation, at a very thin piece of gold foil and examined the resultant scattering of the α particles using a luminescent screen that glowed briefly where hit by an α particle. What did they discover? Most particles passed right through the foil without being deflected at all. However, some were diverted slightly, and a very small number were deflected almost straight back toward the source ([link]). Rutherford described finding these results: “It was quite the most incredible event that has ever happened to me in my life. It was almost as incredible as if you fired a 15-inch shell at a piece of tissue paper and it came back and hit you”1 (p. 68). 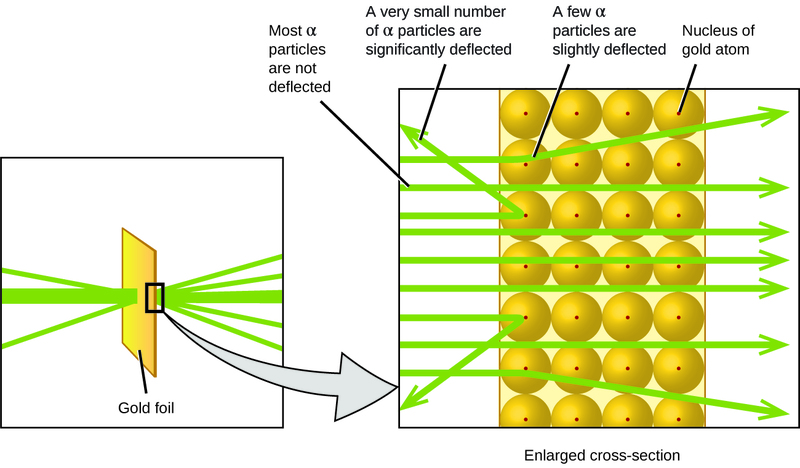 Geiger and Rutherford fired α particles at a piece of gold foil and detected where those particles went, as shown in this schematic diagram of their experiment. Most of the particles passed straight through the foil, but a few were deflected slightly and a very small number were significantly deflected. The volume occupied by an atom must consist of a large amount of empty space. A small, relatively heavy, positively charged body, the nucleus, must be at the center of each atom. View this simulation of the Rutherford gold foil experiment. Adjust the slit width to produce a narrower or broader beam of α particles to see how that affects the scattering pattern. This analysis led Rutherford to propose a model in which an atom consists of a very small, positively charged nucleus, in which most of the mass of the atom is concentrated, surrounded by the negatively charged electrons, so that the atom is electrically neutral ([link]). After many more experiments, Rutherford also discovered that the nuclei of other elements contain the hydrogen nucleus as a “building block,” and he named this more fundamental particle the proton, the positively charged, subatomic particle found in the nucleus. With one addition, which you will learn next, this nuclear model of the atom, proposed over a century ago, is still used today. The α particles are deflected only when they collide with or pass close to the much heavier, positively charged gold nucleus. Because the nucleus is very small compared to the size of an atom, very few α particles are deflected. Most pass through the relatively large region occupied by electrons, which are too light to deflect the rapidly moving particles. The Rutherford Scattering simulation allows you to investigate the differences between a “plum pudding” atom and a Rutherford atom by firing α particles at each type of atom. Another important finding was the discovery of isotopes. During the early 1900s, scientists identified several substances that appeared to be new elements, isolating them from radioactive ores. For example, a “new element” produced by the radioactive decay of thorium was initially given the name mesothorium. However, a more detailed analysis showed that mesothorium was chemically identical to radium (another decay product), despite having a different atomic mass. This result, along with similar findings for other elements, led the English chemist Frederick Soddy to realize that an element could have types of atoms with different masses that were chemically indistinguishable. These different types are called isotopes—atoms of the same element that differ in mass. Soddy was awarded the Nobel Prize in Chemistry in 1921 for this discovery. One puzzle remained: The nucleus was known to contain almost all of the mass of an atom, with the number of protons only providing half, or less, of that mass. Different proposals were made to explain what constituted the remaining mass, including the existence of neutral particles in the nucleus. As you might expect, detecting uncharged particles is very challenging, and it was not until 1932 that James Chadwick found evidence of neutrons, uncharged, subatomic particles with a mass approximately the same as that of protons. The existence of the neutron also explained isotopes: They differ in mass because they have different numbers of neutrons, but they are chemically identical because they have the same number of protons. This will be explained in more detail later in this chapter. Although no one has actually seen the inside of an atom, experiments have demonstrated much about atomic structure. 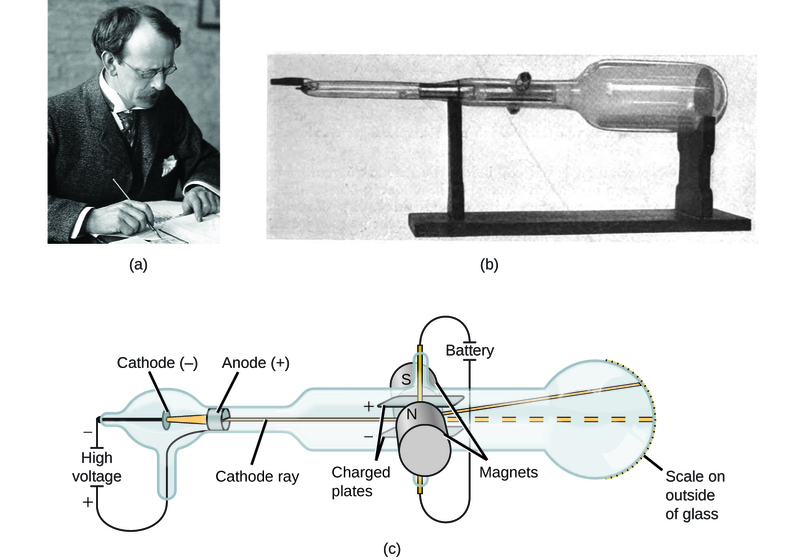 Thomson’s cathode ray tube showed that atoms contain small, negatively charged particles called electrons. Millikan discovered that there is a fundamental electric charge—the charge of an electron. Rutherford’s gold foil experiment showed that atoms have a small, dense, positively charged nucleus; the positively charged particles within the nucleus are called protons. Chadwick discovered that the nucleus also contains neutral particles called neutrons. Soddy demonstrated that atoms of the same element can differ in mass; these are called isotopes. The existence of isotopes violates one of the original ideas of Dalton’s atomic theory. Which one? Dalton originally thought that all atoms of a particular element had identical properties, including mass. Thus, the concept of isotopes, in which an element has different masses, was a violation of the original idea. To account for the existence of isotopes, the second postulate of his atomic theory was modified to state that atoms of the same element must have identical chemical properties. How are electrons and protons similar? How are they different? How are protons and neutrons similar? How are they different? Both are subatomic particles that reside in an atom’s nucleus. Both have approximately the same mass. Protons are positively charged, whereas neutrons are uncharged. Predict and test the behavior of α particles fired at a “plum pudding” model atom. (a) Predict the paths taken by α particles that are fired at atoms with a Thomson’s plum pudding model structure. Explain why you expect the α particles to take these paths. (b) If α particles of higher energy than those in (a) are fired at plum pudding atoms, predict how their paths will differ from the lower-energy α particle paths. Explain your reasoning. (c) Now test your predictions from (a) and (b). Open the Rutherford Scattering simulation and select the “Plum Pudding Atom” tab. Set “Alpha Particles Energy” to “min,” and select “show traces.” Click on the gun to start firing α particles. Does this match your prediction from (a)? If not, explain why the actual path would be that shown in the simulation. Hit the pause button, or “Reset All.” Set “Alpha Particles Energy” to “max,” and start firing α particles. Does this match your prediction from (b)? If not, explain the effect of increased energy on the actual paths as shown in the simulation. Predict and test the behavior of α particles fired at a Rutherford atom model. (a) Predict the paths taken by α particles that are fired at atoms with a Rutherford atom model structure. Explain why you expect the α particles to take these paths. (b) If α particles of higher energy than those in (a) are fired at Rutherford atoms, predict how their paths will differ from the lower-energy α particle paths. Explain your reasoning. (c) Predict how the paths taken by the α particles will differ if they are fired at Rutherford atoms of elements other than gold. What factor do you expect to cause this difference in paths, and why? (d) Now test your predictions from (a), (b), and (c). Open the Rutherford Scattering simulation and select the “Rutherford Atom” tab. Due to the scale of the simulation, it is best to start with a small nucleus, so select “20” for both protons and neutrons, “min” for energy, show traces, and then start firing α particles. Does this match your prediction from (a)? If not, explain why the actual path would be that shown in the simulation. Pause or reset, set energy to “max,” and start firing α particles. Does this match your prediction from (b)? If not, explain the effect of increased energy on the actual path as shown in the simulation. Pause or reset, select “40” for both protons and neutrons, “min” for energy, show traces, and fire away. Does this match your prediction from (c)? If not, explain why the actual path would be that shown in the simulation. Repeat this with larger numbers of protons and neutrons. What generalization can you make regarding the type of atom and effect on the path of α particles? Be clear and specific. (a) The Rutherford atom has a small, positively charged nucleus, so most α particles will pass through empty space far from the nucleus and be undeflected. Those α particles that pass near the nucleus will be deflected from their paths due to positive-positive repulsion. The more directly toward the nucleus the α particles are headed, the larger the deflection angle will be. (b) Higher-energy α particles that pass near the nucleus will still undergo deflection, but the faster they travel, the less the expected angle of deflection. (c) If the nucleus is smaller, the positive charge is smaller and the expected deflections are smaller—both in terms of how closely the α particles pass by the nucleus undeflected and the angle of deflection. If the nucleus is larger, the positive charge is larger and the expected deflections are larger—more α particles will be deflected, and the deflection angles will be larger. (d) The paths followed by the α particles match the predictions from (a), (b), and (c). 1 Ernest Rutherford, “The Development of the Theory of Atomic Structure,” ed. J. A. Ratcliffe, in Background to Modern Science, eds. Joseph Needham and Walter Pagel, (Cambridge, UK: Cambridge University Press, 1938), 61–74. Accessed September 22, 2014, https://ia600508.us.archive.org/3/items/backgroundtomode032734mbp/backgroundtomode032734mbp.pdf. Evolution of Atomic Theory by OpenStaxCollege is licensed under a Creative Commons Attribution 4.0 International License, except where otherwise noted.